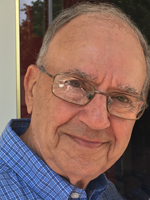 Earl Ulric Morin, 83, passed away peacefully Friday morning March 29, 2019. Known as “Earl the Pearl” by those who knew and loved him, he courageously suffered from Alzheimer’s disease for many years before finally escaping the clutches of his nemesis to once again be made whole in the presence of his Lord and Savior. Earl was born in Lunenberg, Massachusetts on May 13, 1935. Upon completing High School in Newport, he attended Maine Maritime Academy from 1953 - 1956, earning a BS degree in Marine Engineering. Upon graduating from MMA, he was commissioned in the Navy where he proudly served his country from 1956 - 1959. He served as an Engineering Officer aboard the USS Vermilion (AKA 107) during his seagoing service, but he was especially proud of his years of service in the care of The USS Constitution “Old Ironsides” while stationed at The Boston Naval Shipyard. He accepted an opportunity to join the nuclear shipbuilding program at Newport News Shipbuilding (NNS) in 1967. In 1975, Earl was promoted to Vice President of Operations of Newport News Industrial Corporation – a position he would hold until his decision to retire in 1993. Upon retirement Earl could usually be found on the golf course at Kiln Creek until he was diagnosed with Alzheimer’s Disease. He was a 32 degree Mason and a member of the Scottish Rite. He loved to travel, loved to garden, loved listening to the music of Frank Sinatra and loved the game of baseball, especially when it came to his beloved Boston Red Sox. During his last years, he became a faithful super-fan of the Peninsula Pilots, where each home game he would proudly lead all the fans in singing Neil Diamond’s rendition of “Sweet Caroline” in the middle of the eighth inning. Though Earl’s capabilities as a successful business man and active member of his church and community were robbed from him in the early stages of his disease, his intense love of life and humanity only grew stronger as his mental acuity grew weaker. He never met a stranger. If you were a man, he greeted you with a warm smile and a firm handshake. If you were a lady, he would insist upon a big hug. If you were a child, you would likely get both. If there was laughter, he laughed the hardest. If there was singing, he sang the loudest. If Earl the Pearl was around, everyone knew it. He was a humorous, confident, caring and compassionate man who loved his family dearly. He touched the life of everyone who knew him, always for the better. He was preceded in death by his parents Ulric and Frances Morin. He is survived by his wife and best friend of 59 years, Barbara; his faithful daughter and care-giver, Carla Morin-Diehl and her husband, Roger; his sister, Susan Pac (Ron) of Southwick, MA; nephews, Dan Pac (Kristalyn) of Heath, MA, Doug Pac (Jen) of Framingham, MA and Mitch Pac (Erica) of Concord. NH; grandsons, Shaun (Christin) and Jason Diehl; granddaughter, Allyson Diehl McElheney; great-grandchildren Kaylee Romagna, Rylie Peres, Aiden Diehl, Brooke Lewis and Brayden & Courtnee McElheney, and his cat SnoBall. The family would like to express their heartfelt gratitude to Patty Heath and Martha Macrea and the staff of Riverside Adult Day Services, Debbie Whybra and Beth Guethe and the staff of Williamsburg Landing as well as Rev. Rhonda Wheeler, Dr. Bryan Baines and all of the “special” friends, Charlie & Gloria Klein, Billy Bruce and Dave & Mona Rothberg, Frank T. Dulong and Charles Vigne who so generously devoted their time, love and compassion throughout the duration of Earl’s illness. Earl’s family will be receiving friends from 6:00-7:30p.m on Wednesday, April 3, 2019 at Weymouth Funeral Home. Funeral Services will be private. In lieu of flowers, memorial contributions can be made to the Peninsula Walk to End Alzheimer’s, Alzheimer’s Association of Southeastern VA 213 McLaws Circle, Suite 2B, Wlliamsburg, VA 23185. Reference “Earl’s Pearls” on the memo line. Arrangements by Weymouth Funeral Home.